Often, Montgomery County’s public transit system seems like a poorly-executed retrofit to a car-centered community. This is especially true during snowstorms. While roads get lots of attention and people demand that they get cleared quickly, bus shelters often get buried or blocked completely. Metro stations often become inaccessible by foot due to uncleared sidewalks. It is not uncommon to see people in my own area of Forest Glen walking down lanes of high-speed car traffic on Georgia Avenue in a snowstorm. They don’t want to be next to speeding cars and trucks on a state highway, but they often have no choice because the sidewalks are impassable after the plows pass through and push snow up on the walk. As an environmentally-minded person, I find that frustrating. I’m often pushing for more people to walk and asking for buses that are more convenient so more people will choose to ride, thereby reducing carbon emissions. A dangerous trek on an icy road to get to the bus stop isn’t going to make ridership appealing to anyone. But forget appealing. Low-wage earners who often don’t have the option of telecommuting in the snow, those who often can’t afford even one day without hourly wages, and those who can’t drive must always slog through bad weather to get to stations and bus stops—even if it's dangerous. Impassable sidewalks after a snowstorm. Image by the author. 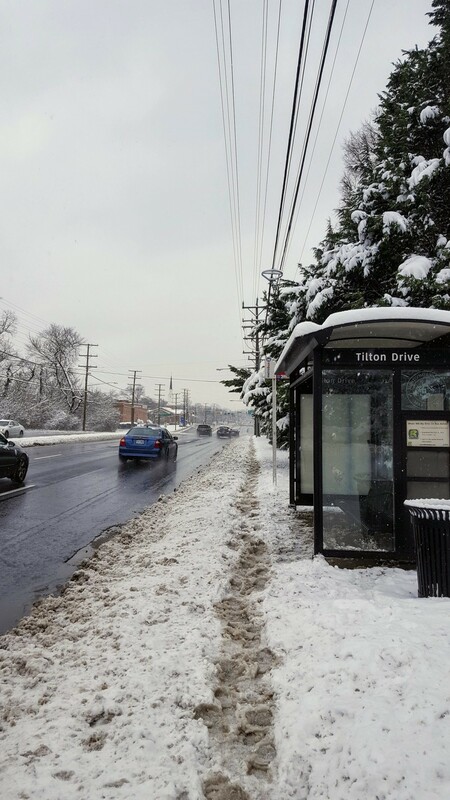 Is transit “snowblind” in Maryland? For those who are physically or visually impaired, snowstorms can be hugely problematic, says Marybeth Cleveland, owner of A to B and Back Orientation and Mobility Services, a company that helps blind citizens learn to navigate their neighborhoods independently. Many of her clients use special canes to determine where sidewalks stop and streets start, as well as the edges where sidewalks meet grass. Clients work with her to memorize their routes to work. They learn the location of each bus stop or Metro entrance, and know what the sidewalks and streets along the way should sound like when tapped. Huge snow banks make that impossible, she says. “You tap the cane to hear a sound, and if there’s snow there, if you hit a snowbank, you don’t really know where to go,” she explains. Sighted people, Cleveland adds, can instantly detect where to climb over or around, an option not available to the blind. For this reason, snowstorms often cause her clients to call for a ride from a private company or car via paratransit, which can be either expensive or hard to arrange. What's more, the snow often sits for days or even weeks after a storm has subsided, meaning that impact for the disabled community is long-lasting. Cross walks blocked by snow can be particularly hard for those with vision impairment. Image by Marybeth Cleveland used with permission. This is also true for those who use wheelchairs. “A lot of us just dread when the snow comes, because we just know we have to stay in,” says Shannon Minnick, Director of Independent Learning Services at Independence Now, a resource and advocacy center for people with all types of disabilities. Minnick depends on her wheelchair, so clear bus stops and Metro stations are vital. She thinks the people in charge of those systems should make sure that all people have access to transportation, all the time, even during storms. But, she notes, it isn’t just transit organizations that need to do more. Clear sidewalks and ramps are Minnick's link to the world, the way she can be a part of the community and contribute: “People with disabilities want to make a positive impact. We pay taxes, we are workers, we mothers, we are fathers.” Our communities need to give everyone equal opportunities and support to live and function. You (or someone) has to shovel. It's the law. Montgomery County requires residents to clear the sidewalks in front and back of their houses within 24 hours of a snow fall ending. Some places, such as Gaithersburg, require clearing within 12 hours. Almost all locations require that residents clear a space big enough not only for pedestrians but also for wheelchairs. The county encourages citizens to report unshoveled walks by calling 311 or using the county’s website. This law seems to serve more as an incentive rather than an enforceable code in many locations. No one has shoveled this bus stop. Image by the author. There also seems to be a great deal of confusion about the ownership of some sidewalks. 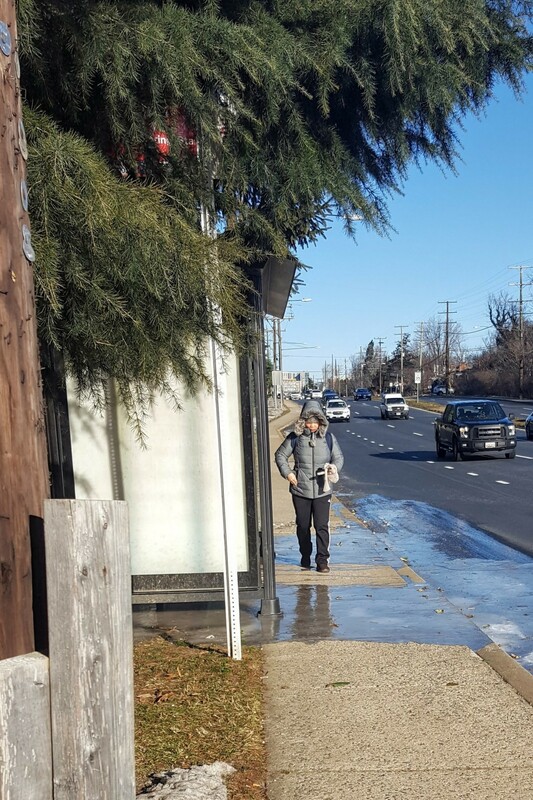 Along Colesville Road near the Woodmoor neighborhood in Silver Spring, for example, there are a lot of relatively new sidewalks that allow safe access to bus stops for nearby neighbors. But in the winter, those walks are often impassable for weeks at a time due to snow and ice accumulation, meaning the investment of building them is not being fully realized. There are also lots of places – mostly when single-family homes line state highways like Georgia Avenue – where the snow mounds can grow four or six feet tall after plows do their thing. It may not be realistic to ask citizens to remove those huge drifts. And yet those areas are often the ones that lead to bus stops and Metro stations. How much would better snow removal cost? Greenberger says that if people see a shelter that hasn't been cleaned or a sidewalk that hasn't been cleared, they can report it by calling 311. He notes that there are more than 5,600 bus stops throughout Montgomery County, and that contractors are supposed to clear out each of the 507 stops that have bus shelters, including cleaning out snow after a storm. Currently the stops with 15 or more boardings per day get the highest priority. People can also use the county’s sidewalk map to determine who is responsible for clearing pathways to bus stops, he says. Sometimes the areas around bus stops are icy. Image by the author. It would be expensive to have municipalities clear sidewalks in all tough locations. 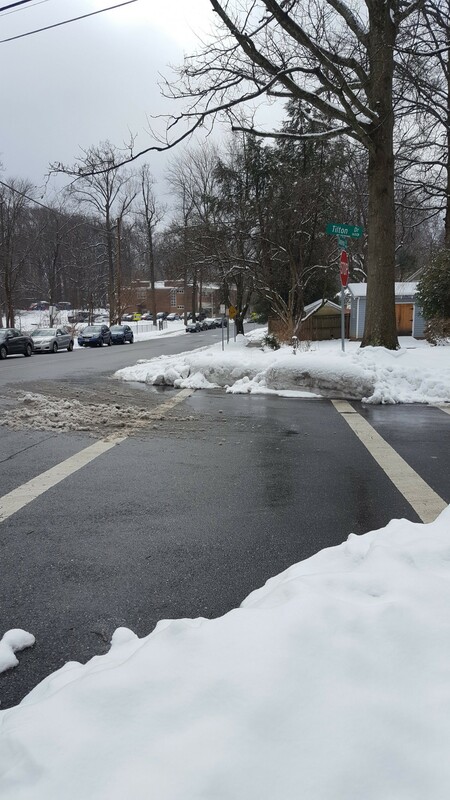 But there are also some less expensive measures that could help with snow, too, says volunteer Kristy Daphnis, chair of Montgomery County’s Pedestrian, Bicycle, and Traffic Safety Advisory Committee. Daphnis thinks that educating the public and putting out more frequent messages about good snow removal would help a lot. Signs, like those that alert people to leaf removal in the fall, could be posted each year, for example. Radio stations could be asked to remind people to clear walks with wheelchair users in mind. Alerts could tell people how to report uncleared sidewalks. Part of the problem is that we don’t get big storms every year and some years we get very little snow at all. This adds to a feeling of chaos when a storm does arrive. But, Daphnis says, it doesn’t have to be that way. Pedestrian safety plans could be made to automatically trigger when a big storm is forecast. “We almost always have several days advance notice for the big ones. We could make better use of that advance warning to take remind people to shovel out,” she says. The same way there are “snow emergency routes” for cars we could create “snow priority routes” for sidewalks, for example. Perhaps what’s needed is a full cultural change that puts transit access higher up on the priority list year-round and sees those who walk, ride bikes, or use wheelchairs as an asset to the community. Sidewalks should not be seen as places where we can store melting snow but rather as vital arteries. Sidewalks could be maintained and valued every bit as much as roads. Alison Gillespie is a freelance writer from Silver Spring who likes to cover urban environmental issues. Find more of her writing at www.alisongillespie.com.